*cue horror movie music* At last, we are finally here! April 1st is the cut-off for all Roses order forms and no, that's not an April Fools joke. Please drop off any remaining order forms to Pizzaz! or Schinkel's Gourmet Meats. Blake Vince recommends cutting a single cheque to Rotary a la school fundraiser style. He reminded us that this is our club's single biggest fundraiser. Margaret Campbell also distributed spreadsheets via e-mail last Tuesday afternoon if you still have multiple orders remaining for either pick-up or delivery. As of last Tuesday (March 26th), we were just over 50% sold out and as of Friday night, we reached 75%! We are only selling Sunrise roses now! Sign-up sheets were circulated for both volunteers on Tuesday & Wednesday afternoon. Roses are scheduled to arrive at the Portuguese Club on Tuesday, April 2nd at 4pm. Deliveries will take place between 8am and 4pm on Wednesday. 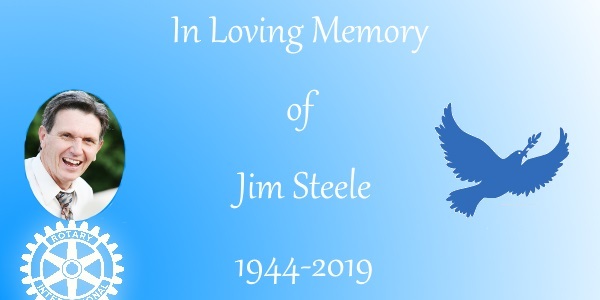 As many of you know, in memoriam of Jim Steele, requests were made for donations to our Rotary club. In order to leave a lasting legacy of Jim's contribution to our club, it has been decided to purchase a ShelterBox in Jim's name. We are currently just waiting for the donation total to be provided by the funeral home. An update was provided by President Kelley on behalf of the board of directors. 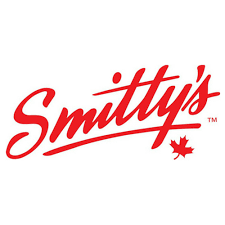 There has been increasing costs annually from Smitty's for our breakfasts and the board discussed increasing the members' cost for breakfast. Discussion was had on whether to eliminate portions of breakfast such as the cereal or fruit to make breakfast cheaper, but we all enjoy different parts of breakfast (those cheesy, onion breakfast potatoes...yum). The board decided to narrow the margin the club earns on breakfast but there could be potential cost increase for breakfast next year. "Learn to do, by doing" is a motto Jennifer Jacobson has been applying to her life since she was a young girl showing her horse in 4-H near Mount Pleasant, Ontario. She was one of 8 children growing up in a blended family, living on a hobby farm. With her mother and stepfather both paramedics, her duty to serve and help people was strong from the time she was 2 years old. She attended Fleming College for studies in Natural Resource Management & Law, leading to a career with the Ministry of Natural Resources spanning such duties as park warden, deputy conservation officer and water drain management (look out C-K, Jennifer says you need some work!). Looking for more consistency in her career, she was hired by the Hamilton Police to attend Ontario Police College. She moved to the Chatham-Kent Police Service after spending a year in Hamilton, in search of a mounted police unit. Jennifer says she's still looking for support to re-start this unit within Chatham (I mean if horses can go through the Starbucks drive thru). Some of Jennifer's work with the Chatham-Kent Police Service includes the marine unit, domestic violence, and bail safety. She's recently switched gears and returned to general patrol after spending a few years with child abuse unit. One of the most memorable (and coldest) moments of her career was having the opportunity to be security at the downhill skiing event located at Whistler Creekside during the Vancouver 2010 Olympics. In terms of Rotary, Jennifer participated in the 2009 GSE trip to Japan. She spent 4 weeks there as a part of the program, and enjoyed spending time learning about Japanese police. Japanese officers train almost daily on shift and are skilled in martial arts. Jennifer commented that Toyko almost has minimal gun violence. From February 2012 to May 2012, Jennifer traveled to Thailand to participate in the Rotary Peace Fellowship program. This program consisted of 25 students from 14 countries around the world. She even spent 10 days in Nepal as a part of the program's curriculum. Of personal note, Jennifer's partner Steve is an OPP staff sergeant at the Ontario Police College and is currently on a UN Peacekeeping mission in Irag. Roses for Rotary Order Forms! Register for the District Assembly before April 3rd, 2019 online! Some people spend their entire life searching for a pot of gold, and we have two, in Doug & Linda Goldsmith. Doug is appealing from sunny, er-well was rainy South Florida for volunteers for the next three months of bingo! 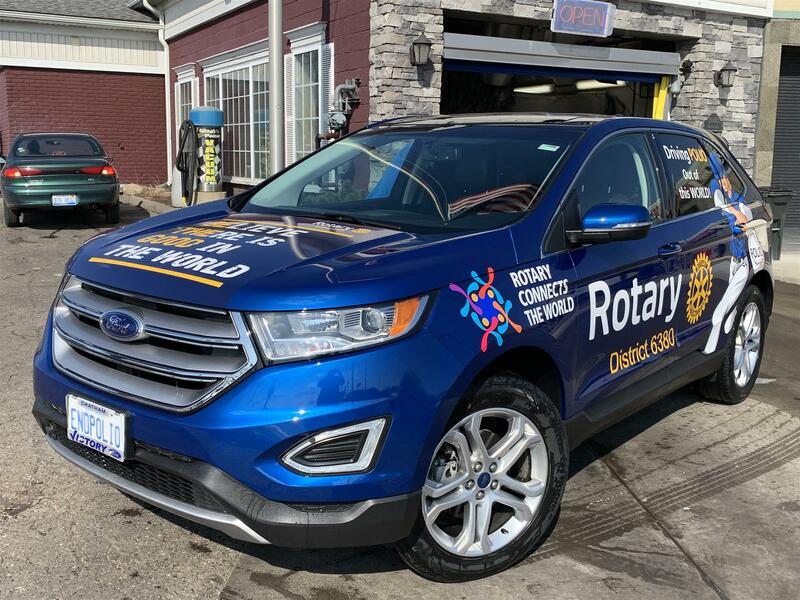 As Sparky drives around our district "driving" polio out of this world, he will be styling in his new Ford! Like any trusty sidekick, his new ride needs a name. All names submitted will be voted on during the District Assembly at Walsh College on April 13th. E-mail your creative name to sparky6380@gmail.com before April 10th. RYLA is accepting applications for Volunteer Rotarian Campers to act as Chaperones. Please contact Paul Toepp to apply at ptoepp@cbwm.com with your application form. 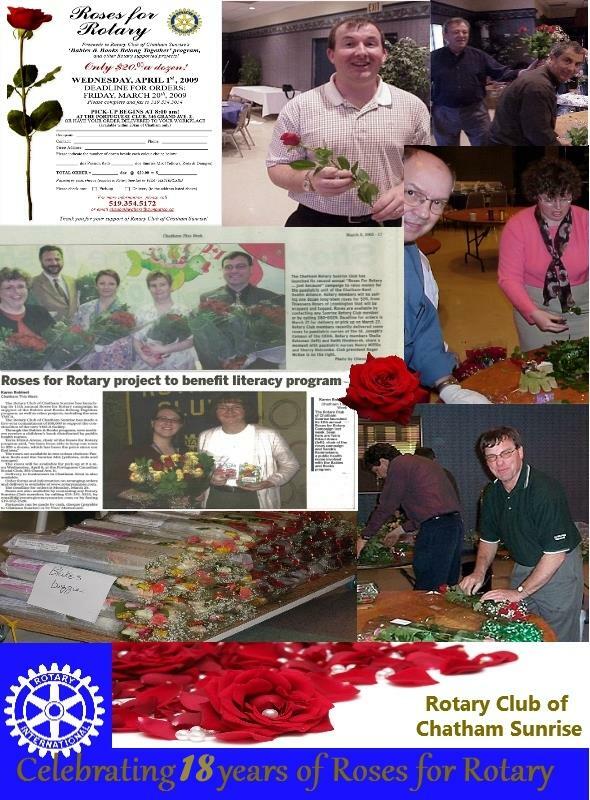 The application form is located with the Roses for Rotary order forms above. 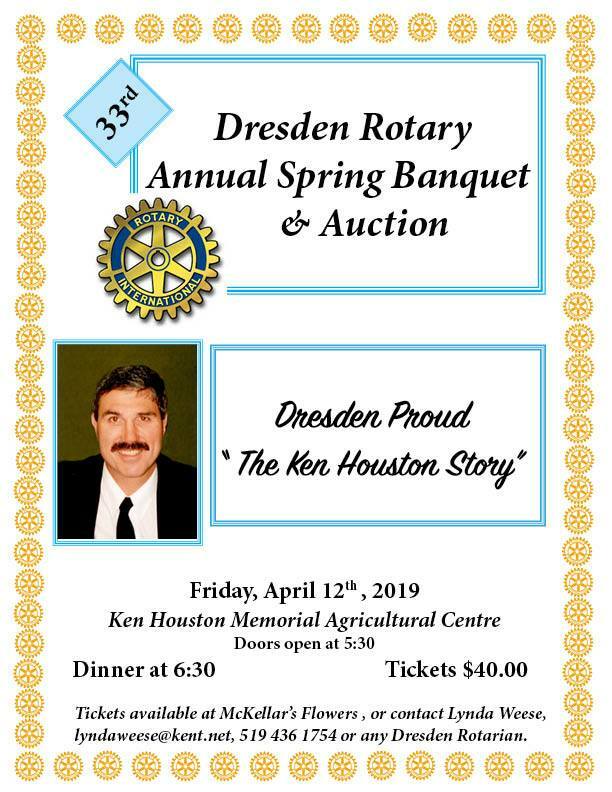 Help support the Dresden Rotary Club honour Ken Houston at their 33rd Annual Spring Banquet & Auction! 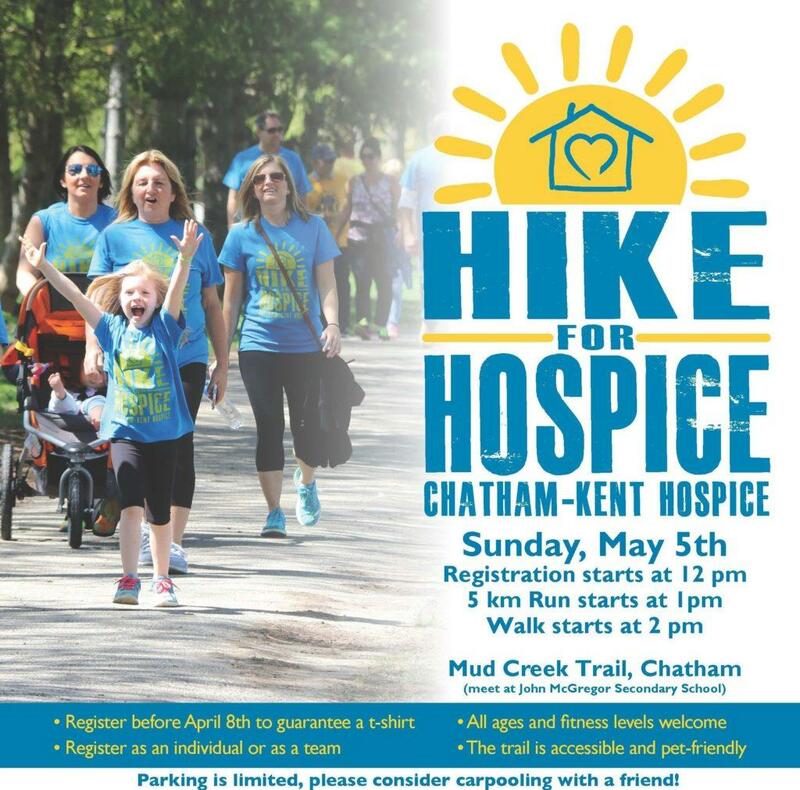 John Lawrence is asking for donations or fellow Rotarians to participate with him in this year's Hike for Hospice on Sunday, May 5th! 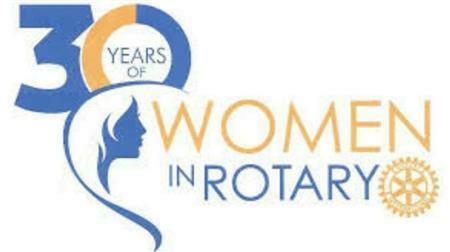 2019 marks the 30th anniversary of Women in Rotary.